Hero mission: Collect 400 rings! Circus Park is one of three possible third levels of Shadow the Hedgehog; in the game's branching path structure, it follows from taking a more heroic, GUN-aligned path through the previous levels. 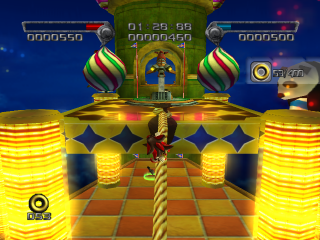 Set inside one of Eggman's ubiquitous carnival facilities, this level challenges Shadow to jump through flaming hoops or complete shooting gallery minigames to collect more rings. Circus Park is a flashy, vibrant stage, filled with bright neon lights, large balls that serve as bumpers, and various gimmicks that award rings, such as giant clocks that, when struck, will begin counting down and cause balloons to float up, creating a shooting gallery. When the countdown ends, the player will receive 5, 10, 25, or 50 rings, depending on how well he or she scores. There are also flaming hoops that will give 5 rings for jumping through, and large towers that when struck (by hitting the center of the special spring), will provide the player with 50 rings. The infamous spinning barrels from Carnival Night Zone also make an appearance, although they rise and fall automatically. This level fulfills the carnival/casino cliché for this game. The more annoying Eggman robots in this stage are Ball Pawns; Egg Pawns balancing on top of giant balls, which must be destroyed before the pawn itself can be damaged. Ball Pawns tend to explode once they are destroyed, so it would be wise to keep distance. In Circus Park, they are styled to look like clowns. The Ball is colored light blue with blue and yellow highlights, while the pawn, who sports a blue party hat, has a light blue torso and a lower body that is pinstriped blue and light blue. This stage shares its name with an area in Billy Hatcher and the Giant Egg. Shadow comes to Circus Park searching for that damn fourth Chaos Emerald, and luckily enough, as he approaches the carnival Tails flys overhead in the Emerald-powered Tornado III. The fox is shot down in crossfire between Eggman's defences and an attacking force of GUN troops, bailing out and leaving the Tornado to spiral away into the distance. Undaunted by his violent arrival, Tails suggests to Shadow that they should team up and "recover" all the rings Eggman's collected in the park. Further in the level Shadow runs into Eggman's Drone, who conversely asks Shadow for his help in defeating the "GUN geeks". The third, neutral option is for Shadow to just ignore them both and spring towards the Tornado crash site, to pick up the grey Emerald. After the fourth checkpoint there's a triangle jump section. Jump to the end to find the door in front of you. Behind the door is another shooting gallery. Potentially useful if you're really bad at collecting rings but you should have no problem getting 400 without this thing. This page was last edited on 31 October 2017, at 16:50.